Tanka Bites and Tanka Bars are easy to find in this aisle display at the Henry's Farmers Market in Costa Mesa. And the best part is that Tanka products are on special all through April at every Henry's store! A group of dance competitors at Saturday's 12th Annual American Indian Student Pow Wow in Dallas show off some of their prize-winnings -- our new Tanka Wild buffalo-cranberry-wild rice sticks! Steve Smith sent us these photos of Tanka Bars and Bites in Henry's Farmers Market in Burbank, CA. Many thanks to Emily Stephens for sharing this photo of a big, old rack of Tanka Bars and Tanka Bites at the checkout in Henry's Farmers Market in Rancho Bernardo, CA. We sure like knowing that Tanka fans won't have any trouble locating their buffalo fix! And the best part is that Tanka products are on special all through April at every Henry's store! Scoring some Tanka Bars at REI in St. Louis! The Part-Time Blog of a Full-Time Indian: What is a leader's responsibility? Longtime vegetarian now fueled by Tanka! We're so happy to be able to announce that our new Tanka Wild sticks will be available on the TankaBar.com website on FRIDAY!!! Expo West 2010 goes Tanka! We're freshly back from the warm sunny days of California, and our Tanka Bar team is reporting from Natural Products Expo West 2010. For us here at Tanka Bar, this is the most influential trade show we attend each year, and we are coming back victorious! When we went to our first Expo West two years ago, we didn't know the names of the distributors, UNFI and Tree of Life/Kehe respectively, and now we do business with them! Who could resist this little face? This little archer would be a great Tanka spokesmodel! We will be placing our very first national advertisement in the May issue of Backpacker magazine as a Thank You for our Editor's Choice award in their April 2010 Gear Guide issue. 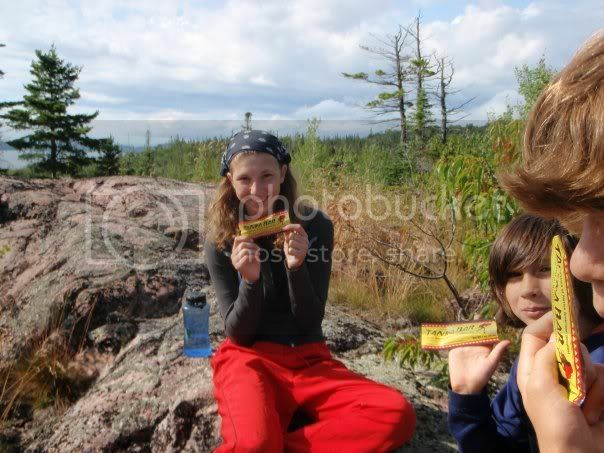 "I hiked out of the Grand Canyon today w/ a Tanka Bar for energy!" Thanks for sharing your pic with us, Grant! It's always a lot of fun when we exhibit at trade shows and our online friends stop by to introduce themselves in person. The Tanka team has been on the road the past couple of weeks at a variety of outdoor-focused trade shows. These photos are from SHOT Show 2010 in Las Vegas, NV, Jan. 18-21. 1ST PHOTO: Shawn Brave Heart, a sales and customer care specialist at Tanka Bar, took this wide shot of a sundog out the back door of his home in Kyle, SD, at 7:55 this morning. This is the proposed label for our new Tanka Wild sticks, which we're debuting at the Archery Trade Association show in Columbus, OH, Jan. 13-15, and at the SHOT Show in Las Vegas, Jan. 19-22. The Part-Time Blog of a Full-Time Indian: Privileges for elders a form of glorified banishment? Azure Standard Quality Bulk and Natural Foods, which specializes in natural, organic, earth-friendly foods, has added Tanka products to its offerings. Every December, the Intertribal Agriculture Council hosts a symposium in Las Vegas, NV, for its members. This year, the theme was "Native Americans Coming Together Caring for Mother Earth." This past weekend was busy for us here at Tanka Bar! At the Rapid City (SD) Civic Center, the Lakota Nation Invitational tournament was in full swing and we were on hand sampling out the new Tanka Bar HOT! Identify the statues and win Tanka prizes! Mark K. and Jason took these photos were around Rapid City, S.D., yesterday and they feature some really famous folks. Tanka Bar is making headlines -- even if they're invented! Our online friends are always coming up with creative ways to show their support, and we love to share their work. One of the beautiful things about our website is that we proudly display customer comments -- for better or worse -- on a scrolling banner on the top of our very first page. Original 'Captain America' an 800-year-old Native? The Part-Time Blog of a Full-Time Indian: Revered and respected elder, or dusty old codger? We have few traditions at our office, but the ones we have we like to stick to. Sharing a meal at holidays is one of them.